CAMPBELL, CA--(Marketwire - November 24, 2008) - After posting the largest single quarter on record in 2Q08 ($360 million), the worldwide cable modem termination system (CMTS) market dropped 32% in 3Q08 to $246 million, says market research firm Infonetics Research in a new report. While the third quarter is typically the slowest quarter for spending on cable broadband aggregation equipment, Infonetics' report, Cable Broadband Aggregation Hardware and Subscribers, says it was made worse this year by the decision of some operators to slow down their purchasing in advance of deteriorating economic conditions worldwide. Downward price pressure also affected the quarter, reducing overall revenue-per-port. "With housing starts down and consumers digging in for what appears to be a long recession, major operators are beginning to slow their rollouts of CMTS and universal edge QAM (UEQ) ports. Although Comcast, Time Warner, Cablevision, and other major North American operators are still moving forward with their DOCSIS 3.0 rollouts, they are doing so with less fervor, as it remains to be seen whether consumers will want to upgrade their broadband connections when budgets are already strained," said Jeff Heynen, directing analyst for broadband and IPTV at Infonetics Research. 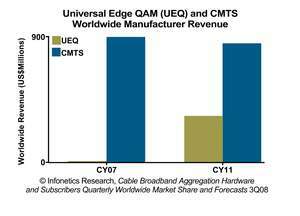 Infonetics' report provides worldwide and regional forecasts and market size for cable broadband subscribers split by standard vs. wideband, CMTS revenue and upstream and downstream ports, and universal edge QAM channels and revenue. CMTS market share is provided for ARRIS, Cisco, Motorola, and others. UEQ vendors tracked include ARRIS, BigBand Networks, GoBackTV, Harmonic, LiquidXStream, Motorola, RGB Networks, Tandberg TV, Teleste, and Vecima Networks. For report highlights, log in to Infonetics' online portal from www.infonetics.com (see Broadband). For sales, contact Larry Howard, vice president, at larry@infonetics.com or +1 (408) 583-3335.